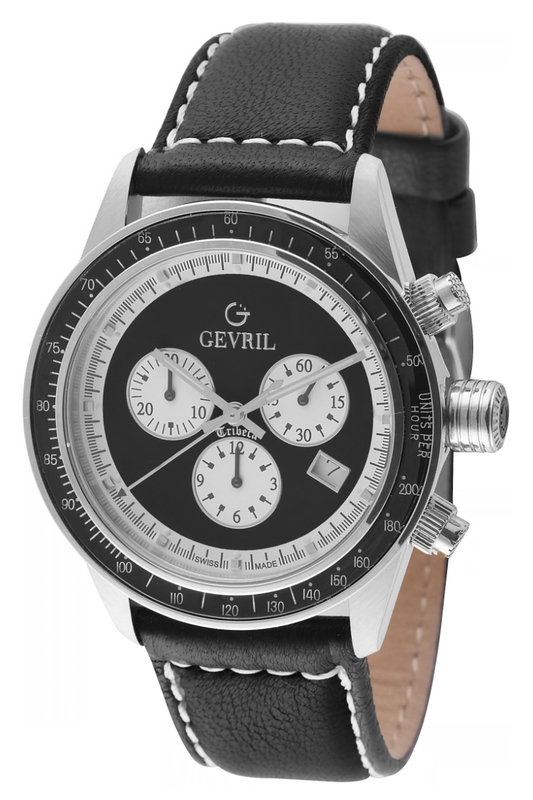 The history of Gevril watches is a story that combines an illustrious watchmaking past with an innovative modern revitalization. The company origins date back to the mid-18th century and Jacques Gevril, the gifted Swiss watchmaker who is the founder and inspiration of the eponymous brand. 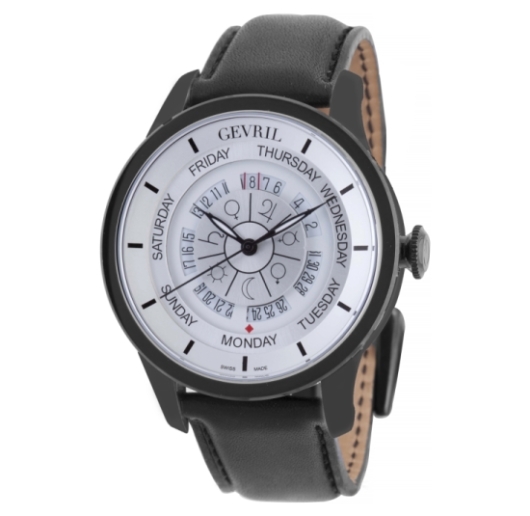 Today the Gevril name endures thanks to the vision of Swiss horologist and businessman, Samuel Friedmann, who lifted the brand to its current heights as an established Swiss watch company. Jacques Gevril was an up-and-coming watch and clockmaker in 1758 when he accompanied his colleague Pierre Jaquet-Droz on a trip to Madrid. There, the men presented a selection of complex musical automata to King Ferdinand VI. The king was so impressed he bought every piece. Jaquet-Droz returned home the following year but Gevril remained in Spain to fortify his reputation as a master watchmaker and was appointed Royal Watchmaker by the king. 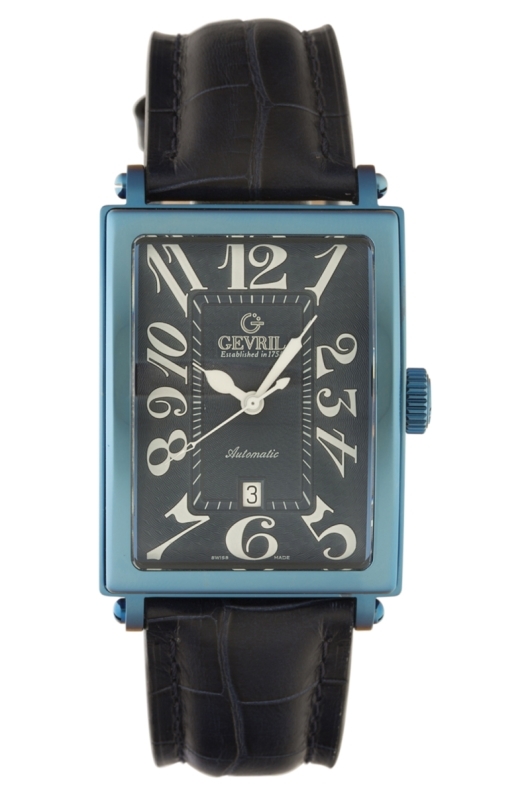 Gevril lived in Spain for many years thereafter, refining his craft and producing watches for the Crown. 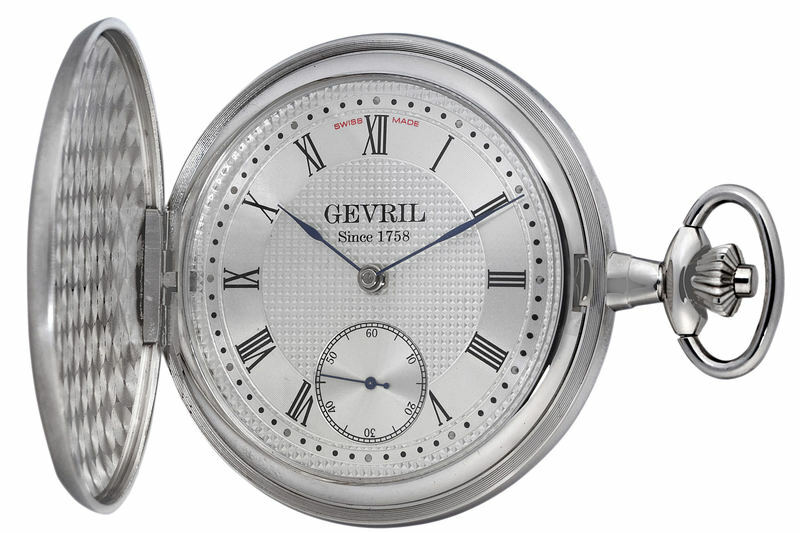 Gevril’s traditions were survived by future generations of Gevril watchmakers including Moyse Gevril and Daniel Gevril, who built their reputations on horological innovations and artistic enameling techniques. Today Gevril pocket watches are highly collectible: one is even located in the Muséum Genève and another is part of the collection of the Wilsdorf family, founders of Rolex. 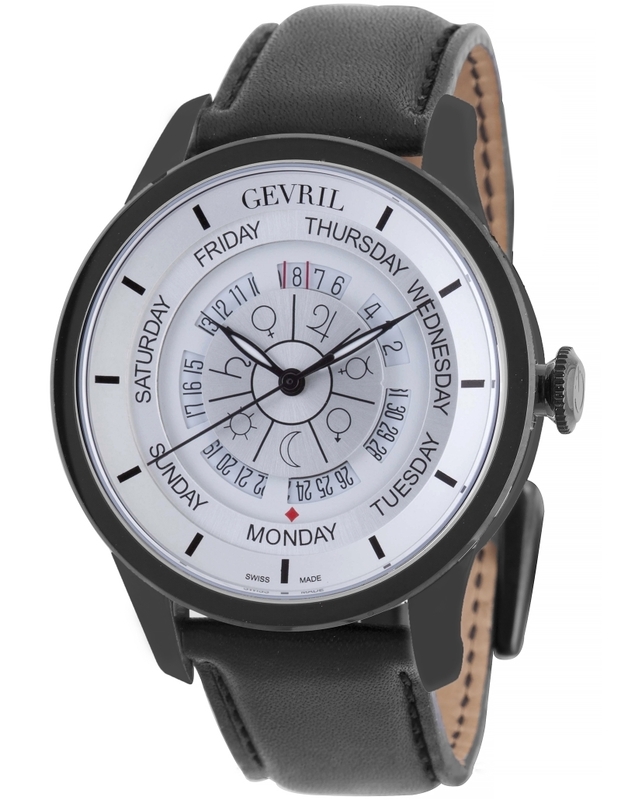 In the 1990s a Swiss distributor acquired rights to the Gevril name, eventually launching a series of Gevril watches at the Basel Fair in 1995. 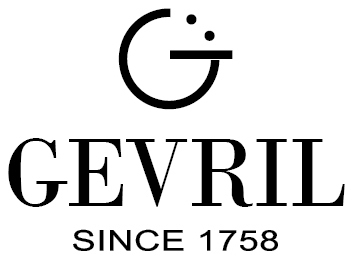 But the brand’s true renaissance occurred in 2001 when Samuel Friedmann, a Swiss businessman with a passion for watches, purchased the Gevril brand. Friedmann, who grew up in Lugano, Switzerland, understood the significance of the Gevril name and wanted to see it prosper in the world of contemporary watchmaking. He was determined to return the brand to its previous brilliance. Friedmann kept the factory – Gevril Horlogerie – in Switzerland, where the company continued to assemble approximately 6,000 strictly Swiss made mechanical watches each year, primarily limited editions in either 18 kt. gold or stainless steel. Gevril headquarters, however, was moved to New York. 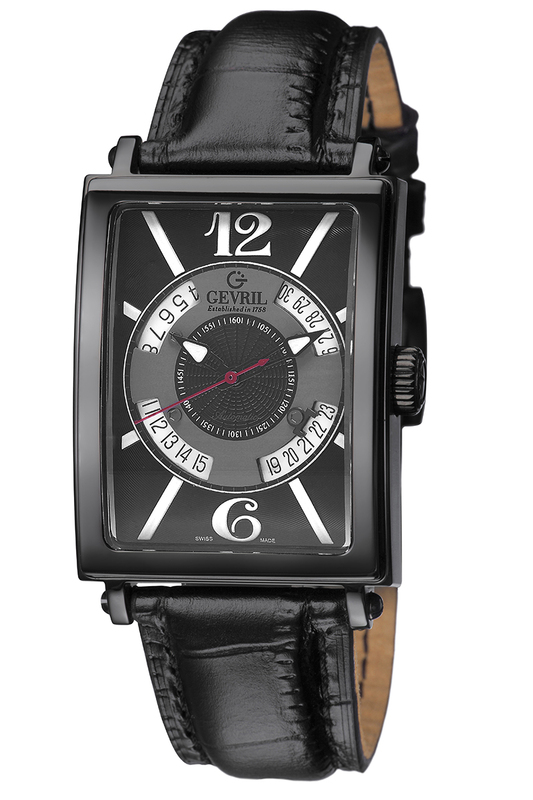 New York City provides the stimulus for Gevril’s modern watch collections, most of which are named after prominent Manhattan neighborhoods and landmarks. The signature collection is called Avenue of Americas. Also known as Sixth Avenue, the Avenue of the Americas is a grand thoroughfare in lower Manhattan that runs northbound through the center of the city from Tribeca to the southern border of Central Park. Among the rich array of buildings on the street are landmarks including Rockefeller Center and Radio City Music Hall. Like so much of New York City’s skyline, the architectural style of the 1930s is prominently displayed on Sixth Avenue. 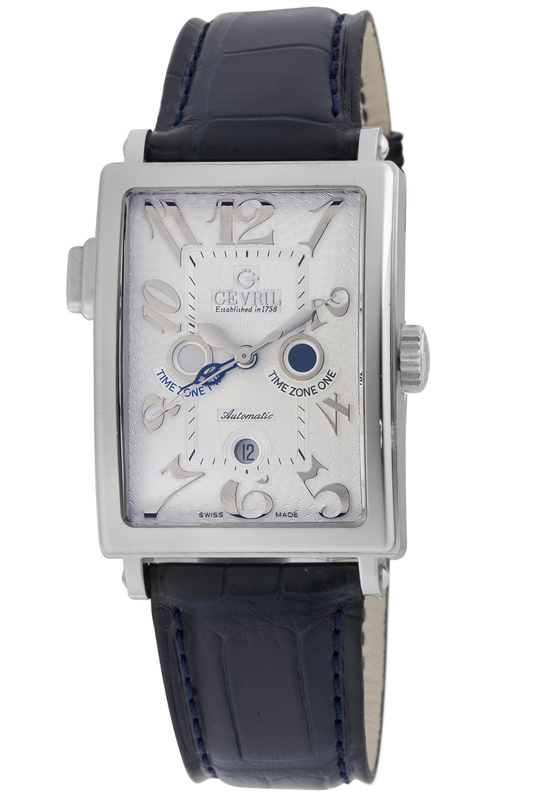 The same art deco design style of the ’30s guides the design of the Avenue of Americas line, a collection of discerning men’s and women’s luxury watches with rectangular curved cases, guilloché dials with stylized art deco numerals and mechanical movements. 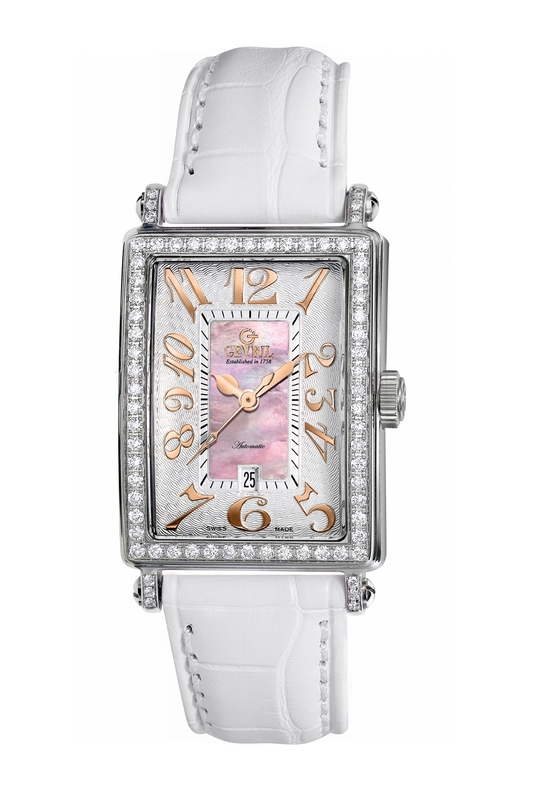 The current Avenue of Americas watch collection includes the following variants. A dual-time-zone watch is one of the most practical and attractive complications in horology, designed for travelers and anyone who makes the jump from one time zone to another on a regular basis. Set in the classic Avenue of Americas case, the Serenade also features day-and-night indicators for each of the two time zones as well as a date function at six o’clock. Like others in the Avenue of Americas line, the Serenade dials have silver guilloché, Arabic scripted numerals, cathedral hands and a 34 x 44 mm curved, rectangular case. Cases are available in stainless steel, 18 kt. rose gold and 18 kt. white gold. The automatic movement features a white-gold rotor; the matching folding clasps are also made of white gold. Using the quintessential Avenue of Americas 34 x 44 mm case as its foundation, the Avenue of Americas Glamour collection adds a heightened level of glitz and sparkle to the tradition with elegant diamond-studded cases. 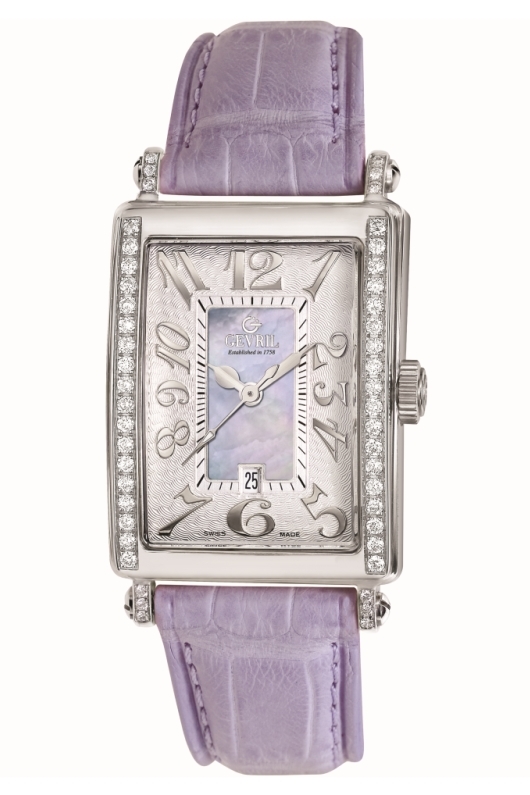 The centers of the dials feature mother-of-pearl in one of three colors. The diamonds are Wesselton full-cuts and there are three different diamond layouts: one with diamonds all around the bezel; another with diamonds along the vertical edges of the bezel; and a third with diamonds along the horizontal edges. The amount of diamonds ranges from a total of 0.58 to 2.21 carats. The Glamour collection is a limited edition of 500 in stainless steel and 100 in 18 kt. gold. 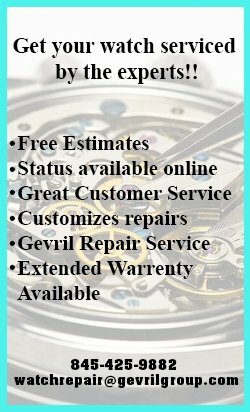 Glamour watches contain mechanical movements. If the standard Avenue of Americas case seems a little too large, the women’s Mini version may represent the perfect in-between size. The Mini has everything that the larger Avenue of Americas watches have including the art deco design, curved case and scratch-resistant sapphire crystal, but packaged in a more delicate 25 x 32 mm case. The Mini also features mother-of-pearl on the dials, and bezels set with up to 131 Wesselton full-cut diamonds that are calibrated and set with a CNC machine for faultless uniformity. The cases are made of high quality 316L stainless steel. 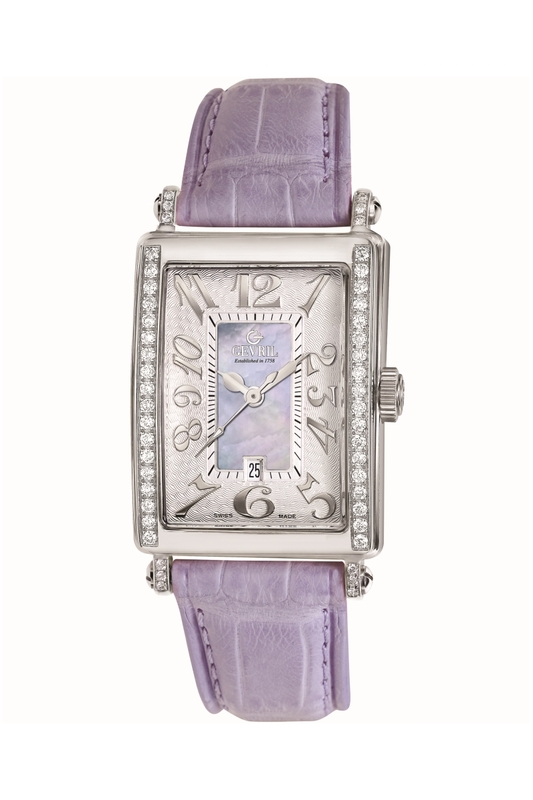 Alligator-textured leather straps in bright colors complement the watches well. Mini watches contain quartz movements. Where the Mini is small, the Super Mini MOP is, well, super small, reminiscent of refined vintage timepieces with jewelry-like appearances. The stainless steel cases are a petite 21 x 28 mm, with 42 Wesselton full-cut diamonds totaling 0.45 carats set vertically on both sides of the bezel and on the lugs. 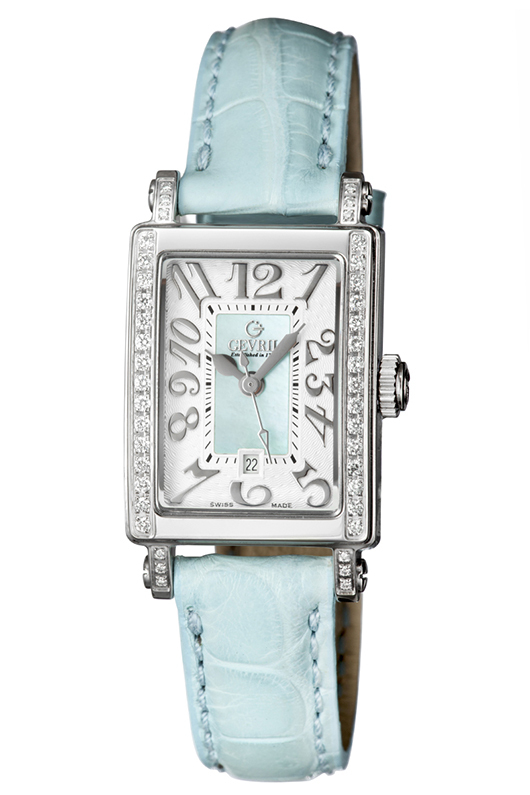 The Super Mini MOP maintains all of the extraordinary details found on other Avenue of Americas watches. 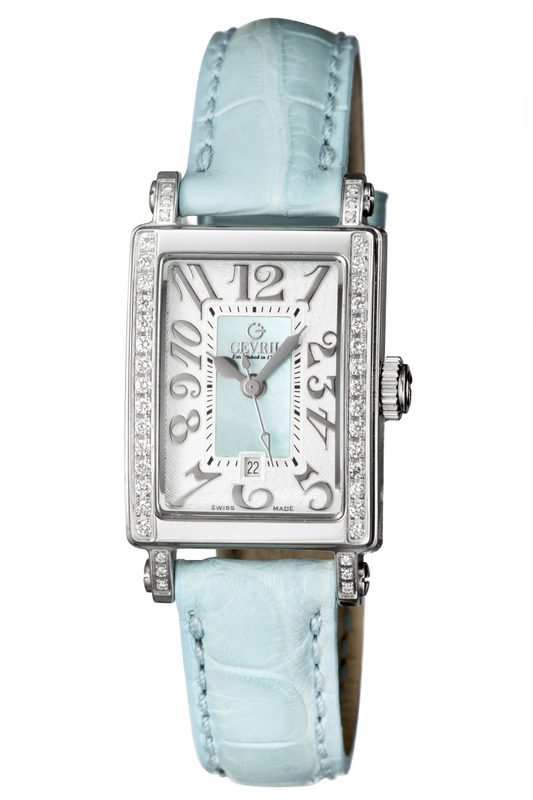 The mother-of-pearl on these models is available in blue or pink, each available in a limited edition of 500 and each paired with a matching calfskin leather strap. 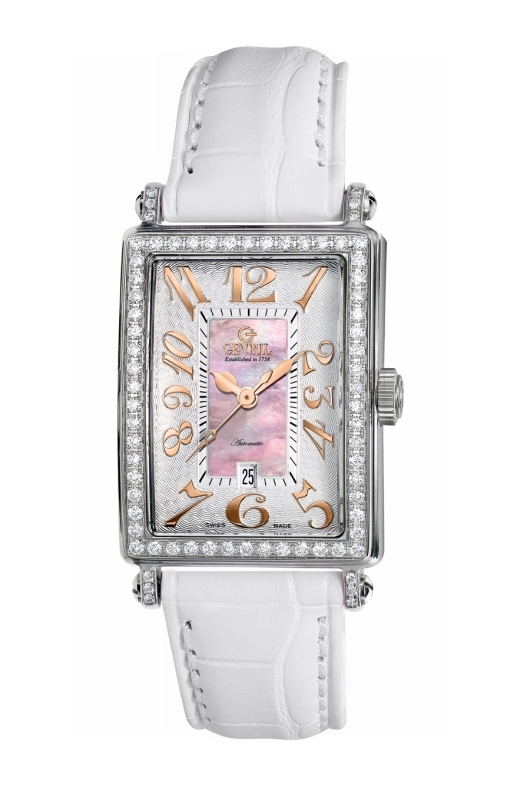 Super Mini MOP watches contain quartz movements. The Gevril Avenue of Americas watch collection is synonymous with elegance. But this year there’s a new version of the watch rolling down Sixth Avenue: a sportier variation aptly named the Avenue of Americas Sport. The refined 44 x 34 mm curved rectangular case remains as do the scripted numerals adorning the dial, but this watch has a decidedly more casual appeal due in large part to the case coatings – one is IP black and the other is IP gun metal – both limited editions of 500 pieces. The deep-black dial is striking and features an open date-wheel, thick arrow-tip hands and a red seconds hand. It’s the same silhouette with a new persona – wholly versatile and full of bravado. New York’s Tribeca neighborhood on the lower west side is among many Big Apple districts to inspire a Gevril watch collection. The first edition of the Tribeca was released in the late 1990s. This year Gevril revamped the Tribeca. While the design maintains the famous triple-register layout and dial elements that pay homage to chronographs from the ’60s and ’70s, there are also some significant changes that give the watch contemporary appeal and make it more accessible. These include a larger 42 mm case, a scratch-resistant sapphire crystal and a precision quartz movement. For those who enjoy the luxurious tint of gold, the new Tribeca also has versions in IP gold with matching accents on the dial and bezel. The most recent Manhattan landmark to inspire a Gevril watch collection is Columbus Circle, a roundabout intersection at the southwest corner of Central Park that intersects W 59th Street, Broadway, Central Park West and 8th Ave. The 45 mm round case contains a dial comprised of concentric rings and wheels (displaying the day and date), at the center of which is a stationary disk displaying the astrological symbols of the days of the week. The caseback features a commemorative engraving of a turn-of-the-century Columbus Circle scene and the automatic movement is partially visible through a small porthole. All Columbus Circle watches are limited editions. Watch lovers delight in the tactile experience of handling mechanical timepieces. 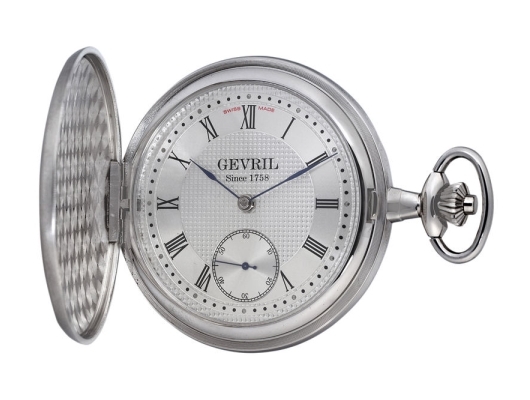 Gevril’s 1758 collection of pocket watches provides a direct link to the beginnings of watchmaking and stands out against the backdrop of fast-paced modern life. Watches in the 1758 collection are superbly finished with 49 or 50 mm engraved cases made of brass or sterling silver. The hunter-style case opens on both sides allowing a view of the hand-wound movement and the guilloché dial. The savonette configuration (the seconds hand and winding stem are both on a vertical plane) makes it easy to adjust the watch and read it simultaneously. The 1758 collection is a testament to Jacques Gevril and Swiss watchmaking heritage. 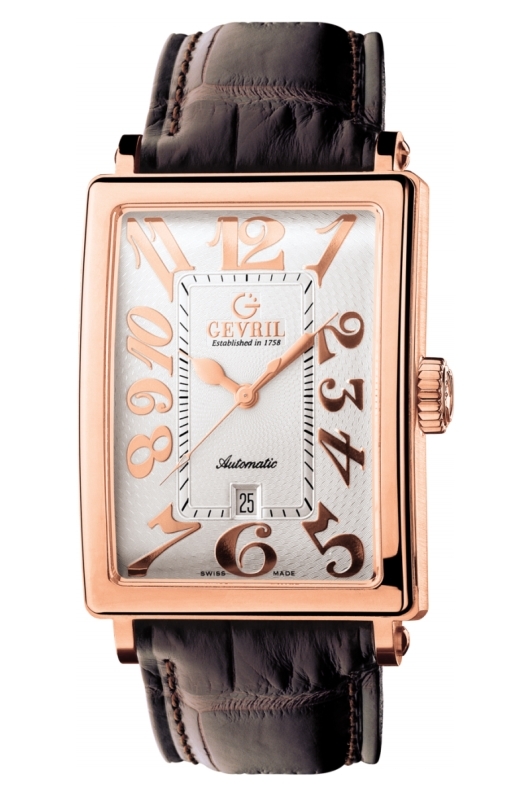 Gevril prides itself on creating imaginative timepieces for original people, which in part is what made the work of Jacques Gevril so special and successful. 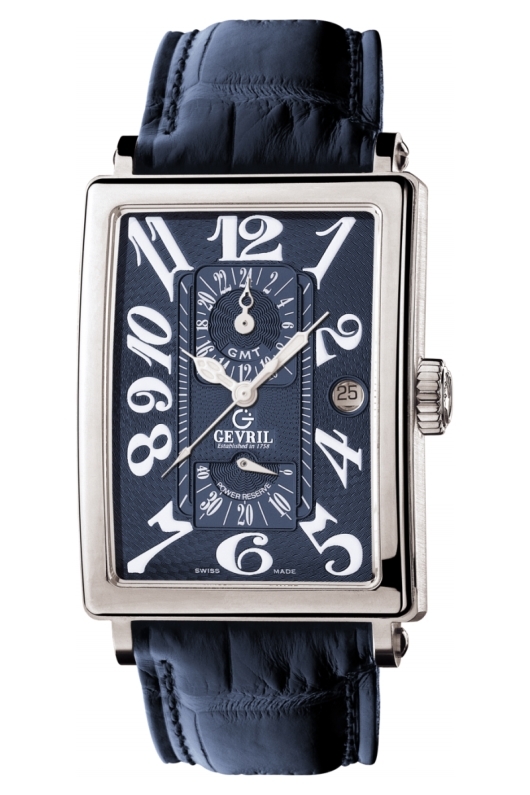 Modern Gevril reveres its Swiss origins and the watchmakers who worked so diligently to build the Gevril name and reputation. Those independent roots combined with a desire to innovate are what drive Gevril watchmakers to this day. 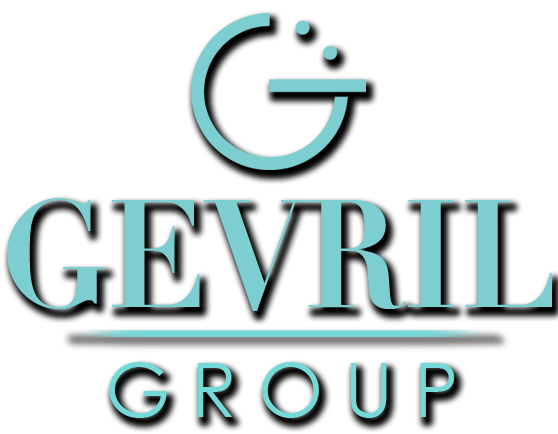 With such a rich and lengthy heritage and one of the greatest cities in the world as its home and constant inspiration, Gevril is thriving – just as its founder once did in service for the Spanish Crown.